I read this article and found it very interesting, thought it might be something for you. The article is called Vitamin Supplements Could Help Children, If We Had Enough and is located at https://archive.indiaspend.com/sectors/vitamin-supplements-could-help-children-if-we-had-enough-61432. Vitamin A could play an important role in fighting child malnutrition. The challenge, as IndiaSpend’s Prachi Salve finds, is getting enough of it and ensuring it reaches all children. The Indian Government, the United Nations Children’s Fund (UNICEF) and several non-government groups (NGOs) have initiated a “Call to Action” on children’s health issues and are focusing on vitamin A deficiency in the country. The latest data shows that 43% children under-5 are underweight (or malnourished) in India. The UNICEF says that adding micronutrients to children’s diet is one of the effective methods to reduce malnutrition. Vitamin A deficiency leads to night blindness and is also one of the leading causes of infant and child mortality. As per Vitamin Angels, an NGO working in the field of child health, a dose of vitamin A every six months alleviates the deficiency and can reduce under-5 child mortality by 24%. The National Family Health Survey-3, conducted by the Ministry of Health in 2005-06, shows that only one in four children between 12-35 months received vitamin supplementation in the past six months. During the same period, only 47% children in the same age group consumed vitamin A-rich food. According to UNICEF, Vitamin A supplementation across the country for under-5 children was only 34% in 2010. Let us now look at the performance of some state governments in tackling the issue. The Annual Health Survey (AHS), conducted as part of the Census in 2011, grouped states like U.P, M.P, Uttarakhand, Rajasthan, Jharkhand, Bihar, Odisha, Chhattisgarh and Assam that accounted for nearly half the population of the country, about 60% births and 70% of infant deaths. Uttar Pradesh has the highest need but the lowest coverage. Several districts in UP have coverage rates below 20% (like Aligarh with 18%, Shrawasti with 15% and Etah 17.5%). On the other hand, some states like Goa, Mizoram and Gujarat have achieved high rates of coverage. While Assam had the highest coverage among the AHS states at 72%, Uttar Pradesh had the lowest coverage at 37.2%. The reasons cited for the poor performance in U.P include low level of awareness among parents, poor service delivery and lack of information. This is more or less true for almost all AHS states. The government has several programmes for vitamin A supplementation, and the following three are among the top featured ones: 1) The National Vitamin A Prophylaxis Programme Against Nutritional Blindness, 2) Reproductive and Child Health Programme under National Rural Health Mission (NRHM), and 3) Integrated Child Development Service (ICDS). The National Vitamin A Prophylaxis Programme, which was launched in 1976, is centrally-funded to provide vitamin A orally to children between ages of 1-5 years. The government tried to link the programme to the immunization schemes like the polio drive but met with limited success. 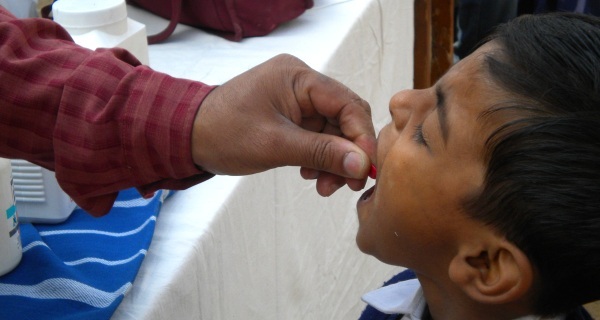 The Planning Commission, Department of Family Welfare and the Indian Academy of Pediatrics feel that the polio programme was a success as the centers were manned by non-health workers but the same strategy could not be applied to vitamin A as there is chance of over dosage which could lead to death. 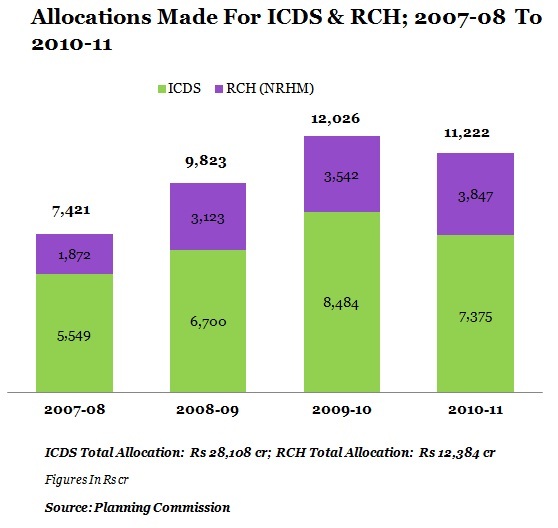 While no financial details are available about the programme, it has managed to reach 43% children in 2005-06 (NHFSIII). Let us now look at the other interventions, Reproductive and Child Health Programme (RCH) and Integrated Child Development Service (ICDS). 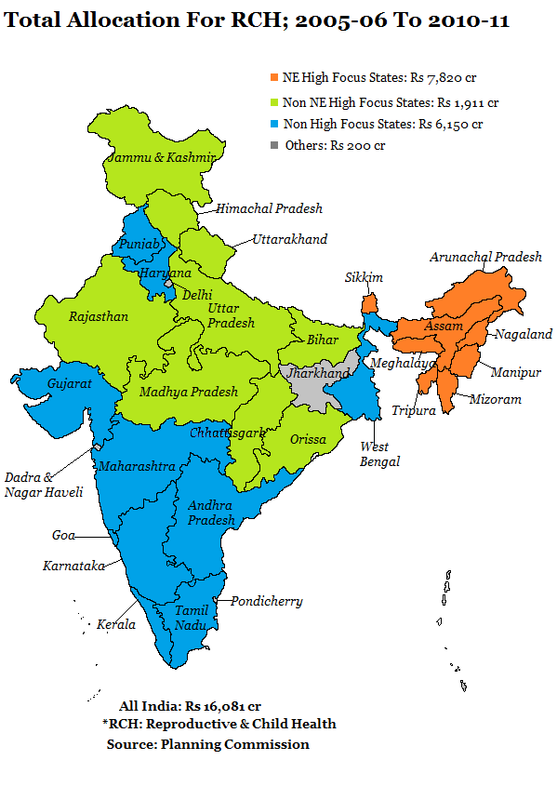 Under RCH, the country has been divided into 4 parts: high-focus, north-eastern states (Arunachal Pradesh, Assam, Manipur, Meghalaya, Mizoram, Nagaland, Sikkim and Tripura), high focus, non- north-eastern states (Bihar, Chhattisgarh, Himachal Pradesh, J&K, M.P, Odisha, Rajasthan, U.P and Uttarakhand), non-high focus states (A.P, Goa, Gujarat, Haryana, Karnataka, Kerala, Maharashtra, Punjab, T.N and West Bengal) and rest of the country ( mostly union territories). So, it can be observed that the government is paying special attention to AHS states as they have some of the highest cases of vitamin A deficiency in the country. One of the major complaints is the lack of supply of vitamin A syrup to ‘anganwadi’ centers (under ICDS) and primary health care centers. Despite the government’s best efforts, vitamin A deficiency continues to be high and supplementation programmes are not yielding the desired results. The Planning Commission has suggested increasing Vitamin A consumption through food, either via better diet or food fortification. 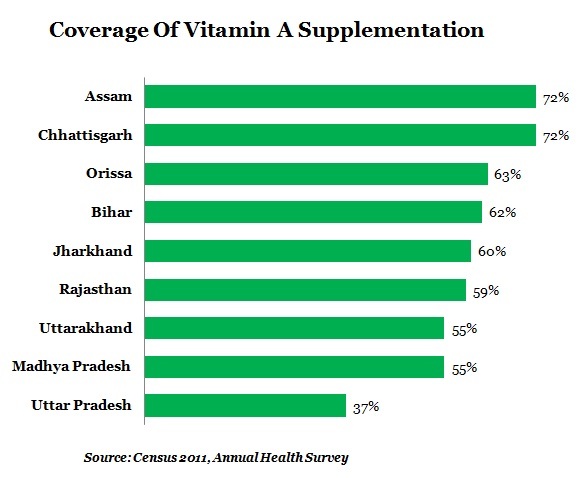 Vitamin A administration is currently a government initiative, which is putting pressure on the public health machinery in states like U.P where children don’t receive supplements. There are a growing number of NGOs working in the area (e.g. DSM and Vitamin Angels) to fill the gaps but they face a lot of local opposition due to lack of government support. please publish report on child labour,women trafficking,crime against women,freedom of cbi suggestion,cause of naxalism,spread and abolishment,reasons for the poverty of rural india while they account of 70%of population and it is the fact that they contribute only15-20% of indian gdp.